Losing data can be frustrating. Although you can easily recover deleted files using Recovery Tools such as Glary Undelete, most of these tools can only recover from a good disk meaning if you have a damage disk, such tool can be useless. 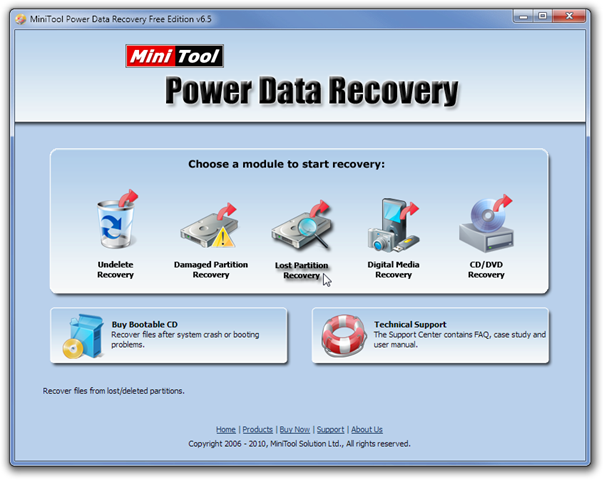 Fortunately there are powerful recovery tool like Power Data Recovery. It is an easy-to-use and all in one free file recovery software for home users. Easy to use because you don't need to be techie to use it. Its highlight feature is the ability to recover data from damaged, reformatted hard drive as well. From its Main interface, you will see the different supported recovery types, including Undelete Recovery, Damaged Partition Recovery, Lost Partition Recovery, Digital Media Recovery, and CD/DVD Recovery. Choosing one of them will start the recovery wizard. 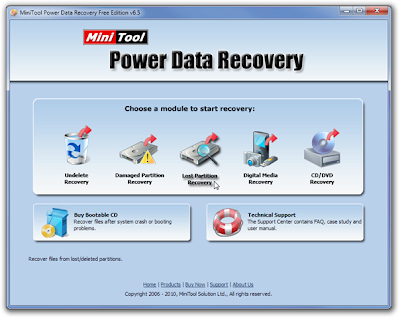 MiniTool Power Data Recovery can recover files from hard disk, RAID device, CD, DVD disks, memory card, memory stick, and flash drive. It works on all versions of Windows, including Windows 7 (Both 32-bit & 64-bit systems are supported). I tested it under Windows 7 x86. If you lose data on your iPhone, you can try an iPhone Data Recovery Software from Tenorshare to help you to recover iPhone lost data.